B"H the last few days I took advantage of being homeless and discovered a bunch of New Nanach, and on the way to be Nanach, Shteibels (homey synagogues), I got some footage of them on video, and will B"H be posting them soon. 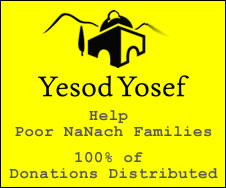 There' s one in Rosh HaEyen (full fledged Nanach. with Mikva, Kitchen, and more), Chaifa ('Beis Rabbainu' well on the way to Nanach B"H. with Mikva, and accomodations for all Nanach! ), and Tsfas (general Breslov but with Nanach sforim and many Nanach hanging out there). Also I met I guy from Migdal HaEimek who is very close friends with HaZamir and has a Nanach shtiebel in his house.